Imagine what it’s like to be homeless as a child and going from one foster family to the next with your sibling. Imagine living in poverty in the Bronx with a single parent who has to work all the time and no other family to support you. Imagine having two parents who are drug addicts and losing your father to a drug overdose. By the time you are 17, you’ve faced any one or many of these challenges, and against all odds, you’ve overcome these obstacles and are now reaching your goal to go to college to continue your education and get a degree. The situations above represent the experiences of three college-bound students, Ikie, Esther, and Estephanie, in the Roadtrip Nation Beating the Odds documentary. 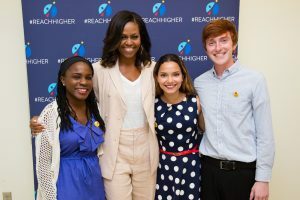 Released on public television this past June, fueled by ACT’s Center for Equity in Learning, with content advisory support by Michelle Obama’s Better Make Room initiative, the documentary followed the students on a cross-country road trip journey. Over three weeks, these three amazing students blazed a trail from New York to California in a green RV to interview prominent and inspiring leaders along the way in their fields of interest. The leaders they interview – including Michelle Obama, Geoffrey Canada, Tristan Love, and Elaine Del Valle – share how they too overcame adversity to become the successful professionals they are today. Still need a reason to watch? Roadtrip Nation is passionate about helping all students see their individual strengths, learn how to navigate challenges, explore pathways, and achieve their academic and career goals. You can engage with the content using Roadtrip Nation’s free viewing guide that includes additional links to custom educational resources for educators, mentors, and advisors to host their own screening and engage with students after watching the film to collaboratively discuss key themes and activities. “Beating the Odds” encourages students to use their voice to not only advocate for themselves, but to reach out and learn from leader’s stories and get connected with resources, groups, and communities Check out the Share Your Road community where students can hear advice from individuals who persisted in overcoming odds to complete postsecondary education and professionals can share their stories with students. Check out “Beating the Odds” and see for yourself what Ikie, Esther, and Estephanie learned from these inspiring luminaries who, like them, were first generation college students and made it on to greatness through difficulty. Watch it online and access the viewing guide at: beatingtheoddsfilm.com. Want to keep the conversation going? Share your road at: act.shareyourroad.com. The premiere screening of “Beating the Odds” was hosted this summer at the Boys & Girls Clubs of America – National Keystone Conference in Atlanta at a super session attended by more than 150 Keystone club students. Following the screening, I had a chance to connect with Cece, a high school student from Colorado and a Keystone club member who worked with our team to help moderate and introduce the panel speakers for the Q&A after the screening. She said she didn’t expect to get as much out of the documentary as she did. As a Keystoner, we already know how to speak up, be loud (we’re LOUD! ), and use our voice but, Cece told me, this film reminded us that we all have some sort of obstacle, and taught us how to use our voice to not only speak up for ourselves, but for other students that we know can use our help.